Prominent & Leading Manufacturer from New Delhi, we offer single chamber vacuum packing machine and double chamber vacuum packing machine. Vacuum Packing Machine Single Chamber Single chamber vacuum packaging machines can finish the whole programs of vacuum extraction, gas flushing (optional), sealing, cooling and exhaust automatically. The products after packing by Single Vacuum packing machines can be prevented from oxidation, going mould, insects or getting damp, thus can be kept fresh for longer time. Single chamber vacuum packaging machines available in Models SPVP 400, SPVP 500 and SPVP 600 can finish the whole programs of vacuum extraction, gas flushing (optional), sealing, cooling and exhaust automatically. The products after packing by Single Vacuum packing machines can be prevented from oxidation, going mould, insects or getting damp, thus can be kept fresh for longer time. 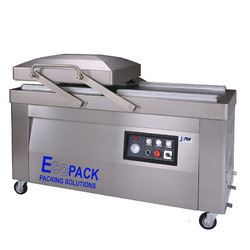 The products after packing by Single Vacuum packing machines can be prevented from oxidation, going mould, insects or getting damp, thus can be kept fresh for longer time. 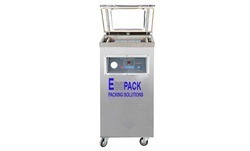 Single Chamber Vacuum packing machines are useful for packing of meat products, sea food, medicine, electronic components, hardware’s, and medical instruments etc. Vacuum Packing Machine Double Chamber Double chambers vacuum packaging machine can complete the set programs of vacuum extraction, gas flushing (optional), sealing, printing, cooling and exhaust automatically. The products after packing can be prevented from oxidation, going mould, insects or getting damp, thus can be kept fresh for a longer time. Double chambers vacuum packaging adopt “BUSCH” vacuum pump. Double chambers vacuum packaging machine can complete the set programs of vacuum extraction, gas flushing (optional), sealing, printing, cooling and exhaust automatically. The products after packing can be prevented from oxidation, going mould, insects or getting damp, thus can be kept fresh for a longer time. Double chambers vacuum packaging adopt “BUSCH” vacuum pump.